View our printable District map here. 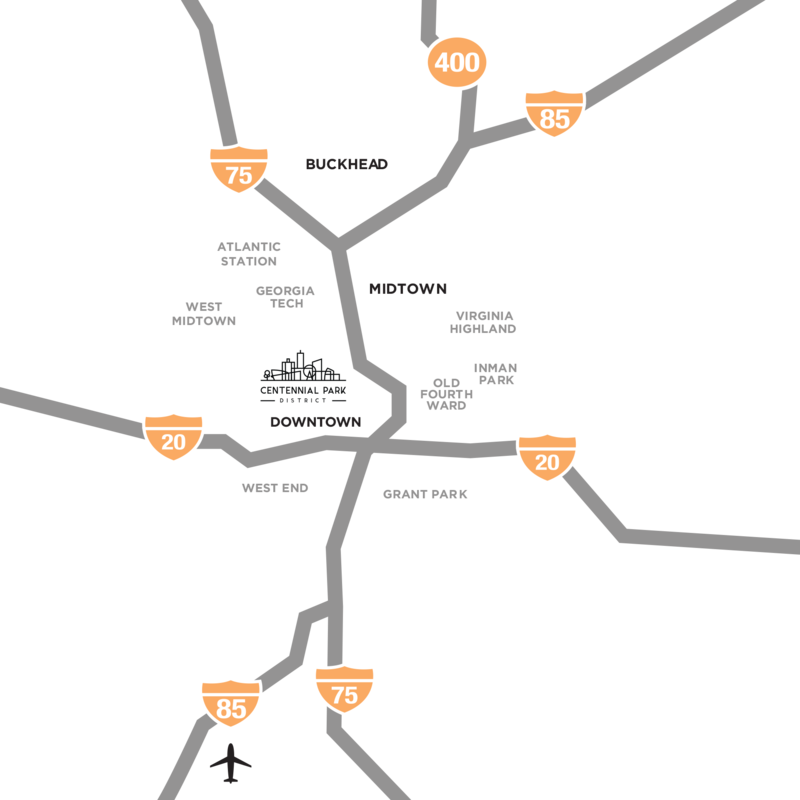 If driving via I-75/I-85, the Centennial Park District is located off of Exit 249C (Williams Street) from the North and Exit 249D (Spring St.) from the South. Via I-20 East/West, take Exit on I-75/I-85N toward Atlanta. Exit 249D (Spring St.). Spring Street veers left and becomes Centennial Olympic Park Drive NW. Turn right on Baker St. then left or right on Marietta St. to access parking. For all drivers, a 670-space covered parking deck is located at the Hilton Garden Inn, and additional public pay lots are located throughout the District. If taking MARTA, the Centennial Park District is a 5-10 minute walk from either the Dome/GWCC/Philips/CNN station on the Blue/Green line or from the Peachtree Center station on the Red/ Gold line, in addition to bus service. The District can also be reached by disembarking at the Centennial Olympic Park stop along the Atlanta Streetcar route.